Duplicate files can be a problem for your system when you are running on low disk space. There are few nice tools that can easily find duplicate files stored in various locations of your system. But finding duplicate photos has few big challenges. Editing, resizing, cropping end up with multiple instances of a photo. So, photos may have duplicate versions and near identical versions on your system. If you are trying to cleanup disk space in your system, you should try to find out all duplicate and near identical photos. I have tried many duplicate files and photos finder tools and find that “Awesome Duplicate Photo Finder” is a really nice tool. It is free, simple and does a good job. 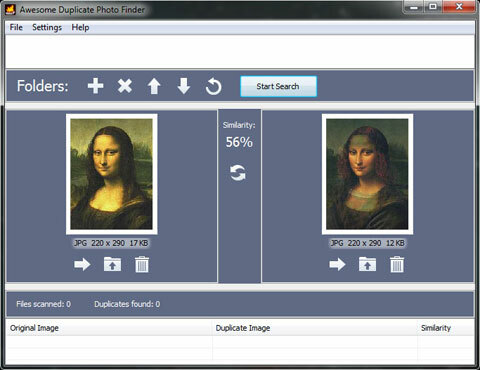 It can easily find duplicate and near duplicate photos. This tool comes in two versions, installable and portable. You can carry portable program with you and it runs without installation. Run the tool and drag your photos folder in the tool. You can add multiple folders at the same time to search duplicate photos. Then, click on big start search button. Depending on the folder size, it will take few minutes to search duplicate images. After the search finished, it shows all duplicate photos along with similarity percentage. 100 % similarity means you have got the exact copy of the photo. This tool supports various image types including JPG, BMP, GIF, PNG and TIFF. The main advantage of this tool is that it also works on a network drive and removable drives. You can move or delete duplicate files direct from the tool. This tool can also find the compressed and other versions of a photo having different resolution.